Bed bugs are named bed bugs for a very good reason because they mainly inhabit and bite you while you're in your bed sleeping. To date, most bed bug experts agree that the single most effective step you can take to protect yourself from a bed bug infestation is installing both Bed Bug Mattress Covers and Bed Bug Box Spring covers on ALL of the beds in your home. One point of clarity, while commonly called Bed Bug Mattress Covers, you really want Bed Bug Mattress Encasements. Encasement products are very different than simple Mattress covers. These specialized products encase the mattress, and go beyond just covering it. One the first and most significant steps you can take to reducing your risk of a bed bug infestation is to practice bed bug prevention strategies, especially for your bed, and immediate surrounding areas. This inclues installing Mattress Encasements and Box Spring Encasements. Recently, there has been some debate amount bed bug experts, as to whether Mattress Encasements are truly effective and whether or not they should continue to be used. As of this writing, on July 2018, leading bed bug experts, including the leading expert on bed bugs, Dr. Richard Cooper still agree that use of Mattress Encasements is highly effective. Eliminating bed bugs inside of a mattress or box spring, is nearly impossible. Only a few treatment methods are effective, including steam. Encasing mattresses and box springs, resolves this issue. Installing Bed Bug Encasements removes both your mattress and box spring as potential nesting and hiding places for bed bugs. Mattress Encasements keep bed bugs living inside of your matress and box springs from biting you. This is a significant benefit, given the majority of bed bugs in homes are most likely in your box spring or torn mattress. Encasements will help with detection of bed bugs, since spotting them on your bed with an encasement is much easier. Using Encasements will help protect your mattress and box spring overall, making them last longer, and protecting their value. Some mattress and box spring designs cannot be encased. In particular, UK styles that have built in wheels. Bed bug encasements will not keep bed bugs in your home from biting you. Bed bugs can still travel onto your bed, and bite you. Testing has shown, that unless your mattress is torn, bed bugs should not be able to get in your mattress in the first place. This is not the case for box springs. Using a cheap or poorly designed Mattress or Box Spring Encasement, will make you think you're protected when you really aren't. Always be sure to use recommended AND tested products. Pets and children, especially cats, can often tear or cut mattress encasements, with you knowing it. We recommend that you frequently inspect your encasement, and if torn, replace them immediately. Given both the pros and cons of bed bug mattress encasements, we still highly recommend them. The arugements commonly made against encasements can easily be resolved by purchasing proven products, and by frequent inspection. Bed Bug experts generally agree, especially those here in the US. The bottom line is that mattress interiors and their associated box springs provide optimal hang-out spots for bed bugs. Living in your bed, bed bugs have access to food (you), lots of hiding places, and plenty of room to move about and multiply. One of the most simple and effective prevention strategies you can implement is encasing your mattress and box spring with bed bug mattress encasements. Detection - The smooth and white surface of the encasement will help you more easily see bed bugs, and signs of bed bugs. Bed bugs have very few, if any places, to hide on an encasement, and will be easily spotted. Protection - Since the encasement completely wraps the mattress and box spring, bed bugs are not able to get on them or in them to hide, feed, and multiply. Treatment - The majority of bed bugs live and thrive inside of your mattress and box spring. Encasing both, seals the bed bugs in, where they cannot feed, and will eventually starve and die. Using encasements is also significantly easier than attempting to treat a bed, due to all of the hidden corners and folds, not to mention having to penetrate the Mattress and Box Spring itself in order to reach and kill the bed bugs. This is all a very time-consuming process, where installing encasements only takes a few minutes. There are a number of encasement options available on the market, some work far better than others, and the various designs have different sets of pros and cons. There are numerous types of encasements available on the market, some don't work well at all and are prone to failure, while others work, but have numerous pros and cons. Many encasements don't work at all for bed bugs, as they aren't designed for them. Bite-proof basically means the encasement prevents bed bugs from being able to bite you and feed through the material. General encasements are generally NOT bite-proof. You'll want to make sure you purchase scientifically tested and proven "bed bug encasements", specifically designed for bed bugs and dust mites. When selecting a mattress cover, be sure that it is made of a bite-proof material. If you are dealing with a mattress that is infested with bedbugs, and are using mattress covers to protect you and your bed, the bed bugs may still be able to feed through the fabric. So look for this term “bite-proof” when purchasing a mattress cover. Fortunately, all "bed bug mattress covers" are bite proof. However, normal mattress covers often are not. The purpose of the encasement is to keep bugs in the mattress in and keep bugs not in the mattress, out. If the fabric isn't the right kind, bed bugs will be able to travel through the fabric, rendering the encasement useless for bed bugs. Again, you'll want to purchase encasements specifically designed for bed bugs, that have been proven to not allow bed bugs in our out. Proper zipper design is critical. Zippers with large teeth allow smaller bed bugs to maneuver through the zipper. Zipper teeth should be very small, and the teeth should mesh tightly together in order to seal the opening. Another common failure point for poorly design encasements is where the zipper stops after being zipped shut. Some encasements left openings, where the zipper would not completely close. Other encasements will close, but then over time slowly open back up as the encasement is stretched and moved around. Some manufacturers, like the Protect-a-bed line provider a zipper lock to ensure the zipper remains closed. Not only should the fabric prevent bed bugs from biting, and keep bed bugs in or out, the fabric should be breathable to allow air to circulate through the mattress. Many new encasements are also waterproof, offering protection against spills, or nighttime accidents. While many manufacturers advertise their products are washable, you don't ever really want to remove the encasement once installed, as you risk allowing bed bugs in or out, which could cause an infestation. Once your encasement is installed, consider it a permanent part of your mattress. 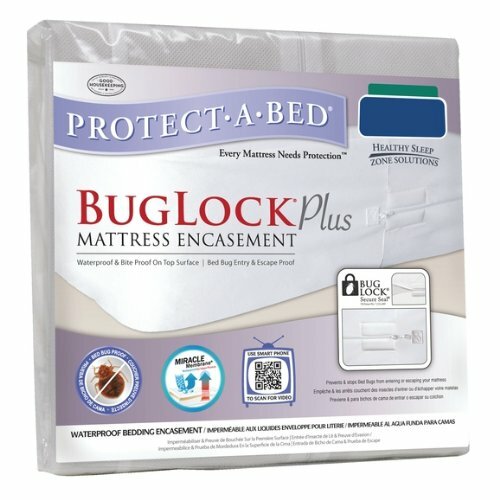 While a number of modern encasement products meet our requirements, one product shines above others, meets (or exceeds) all of our requirements, and consistantly places in the #1 position in Bed bug Matress Cover comparisons and testing: The Protect-A-Bed BugLock Plus. Protect-A-Bed are high quality, and scientifically proven products that will protect your mattress and box springs from bed bugs, and allow you to get a good, bed bug free sleep. They are not the most inexpensive covers, but are proven to be the most effective. Inspect your encasements frequently. If you find holes or tears, replace them immediately. If you have cats, dogs, or children who might tear your encasement, install a thick mattress pad to help protect it. Preferably keep pets off your beds in general. Install foam padding on the corners of mattresses, and especially box springs to help reduce the risk of tearing. Never move the mattress or box spring with the encasement on it.